The English Language Center (ELC) conducts & offers foundation year program for new intake students who want to raise their level of English & develop their skills in speaking, reading, writing and listening. Foundation year program aims to provide background knowledge and develop the student’s skills in mathematics and Information Technology, and prepare them for higher studies in different areas of specializations. All registered students are eligible to enter the Program. Their entry level depends on their linguistic ability. The in-house placement test will determine the english language level of each student and the placement is decided accordingly. This means that not all students will be required to take the four levels. Some may progress through the Program much faster than others depending on the results of the Placement Test. In addition to that, ELC gives the oppprotunity to Level_1 & Level_2 students to sit for a chalenging exam if they score 85% or above in the exam, they will directly promoted to sit in Level_4 Exit Exam. Those who pass the challenging exam with 60% or above in Level_1 will promoted to Level_3 and in Level_2 will be promoted to Level_4. 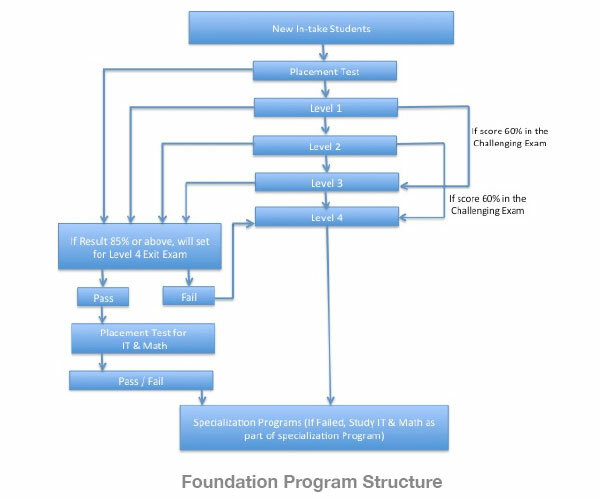 The following diagrams shows the foundation program structure, grading scale and required skills to each level. 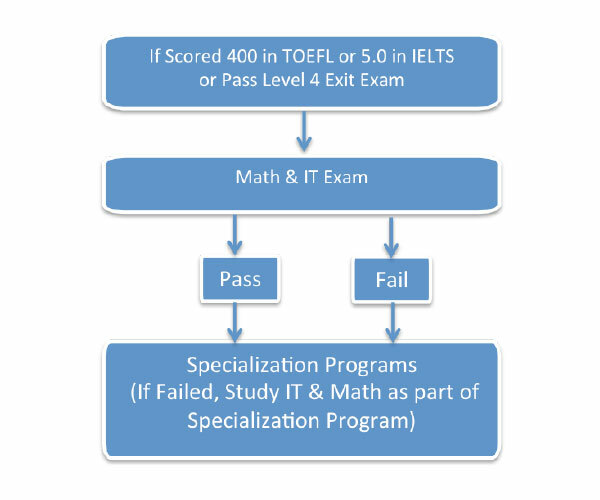 Meeting IT & Maths Foundation Program requirements. The English Language Centre offers courses at the post-foundation level to students of different departments. The courses represent an extension to the English Foundation Programme and aim at assisting students in their academic studies. The focus is on academic skills which students need at this level, such as report writing, presentation skills, and public speaking and communication skills. There are 4 teaching hours per week for each course. The program is running credit hours, which enables the student to choose lecturers he wishes to study with them and to choose his own subjects’ timetable to suit his circumstances according to section availability, for the study hours timing begins at eight in the morning till eight o'clock in the evening. The student can register the minimum or maximum of the credit hours which are specified by the College Organizational Decree in accordance with his circumstances. The program provides training opportunity in the private sector as one of the graduation requirements at any level and thus allows the student the opportunity to learn and experience the real working conditions and gain practical experience by implementing what has been studied from the college subjects. The program allows obtaining a degree in one of the following three levels: Technical Diploma / Advanced technical Diploma, and technical undergraduate. And this depends on the students’ capabilities and potential.